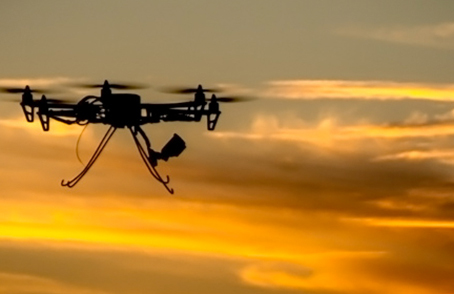 A growing number of state departments of transportation are leveraging innovative drone technology to creatively improve safety, reduce traffic congestion and save money. According to a March 2016 survey by the American Association of State Highway and Transportation Officials (AASHTO), 33 state departments of transportation have or are exploring, researching or testing unmanned aerial vehicles (UAV), commonly referred to as drones, to inspect bridges and assist with clearing vehicle crashes, among other innovative applications. A new report by AASHTO’s Transportation TV explores the many ways that state DOTs are using drones. AASHTO has also prepared a fact sheet that highlights the benefits of UAVs. This spring, Michigan State Department of Transportation (MDOT) is set to begin a two-year UAV study; phase two of an 18-month UAV study completed by MDOT and the Michigan Tech Research Institute in 2014. In the report, MDOT Engineer of Operations and Maintenance Steven J. Cook says UAVs are a safe, reliable and cost-effective way to monitor traffic flows, obtain photos from inside confined spaces and gather data on bridge conditions. MDOT estimates that a standard bridge deck inspection takes eight hours, a crew of four people and heavy equipment; costing at an estimated $4,600. The same inspection with a drone takes two people, just two hours at an estimated cost of $250. The AASHTO survey found that 17 state DOTs, Alabama, Connecticut, Delaware, Idaho, Indiana, Kentucky, Maryland, Massachusetts, Minnesota, Michigan, New York, Ohio, Oregon, South Carolina, Tennessee, Vermont and Washington had studied or used drones while 16 state DOTs — Alaska, Colorado, California, Florida, Georgia, Hawaii, Iowa, Illinois, Kansas, Mississippi, New Hampshire, New Mexico, Nevada, North Dakota, Pennsylvania and West Virginia – were either exploring drone usage, assisting in the development of drone polices or supporting drone research.